It's been a very loooong time since I've posted anything on my blog. I suppose that's partly because of our not having internet connection at home; our lives have been revolving mostly around, well, 'real life'. I must also admit that for quite a while the news of my gut issue wouldn't have been that great so I figured you were best not knowing what's happening at my end. Anyhoo, after spending a quiet winter in our little cabin in the woods here we are again, out of hibernation, safe and (mostly) sound. Before I go ahead and give you a video update of how I've been feeling health-wise, here are a few pics I wanted to share with you first. 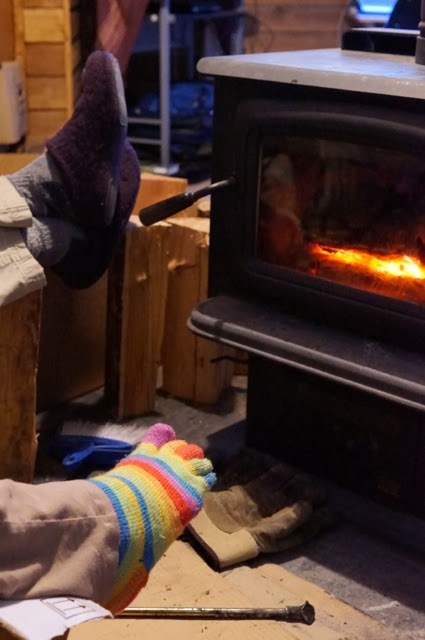 Our cabin is heated by a wood stove so Mr. Donnie had to look after our firewood supply. 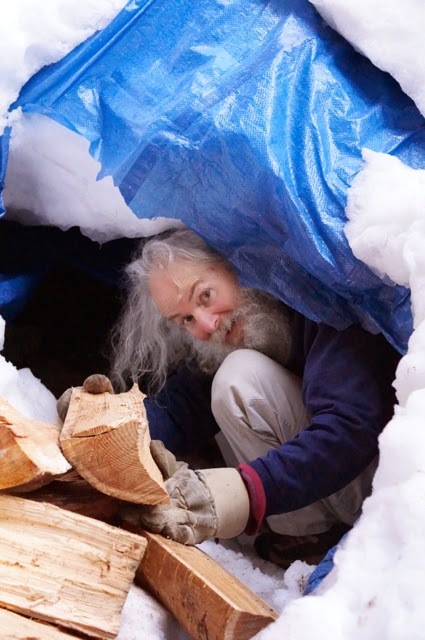 As the wood pile grew smaller over the months, by Spring he had to get on all fours and go into the 'igloo' that had been created by the frozen and snowy tarp. OK, so now fast forward to when Spring was well under way. Here's the humble cabin that has become our home. For the first time in 4 years we have officially turned the page on our nomadic lifestyle and have settled down. We've decided to sell the fifth wheel trailer and truck as it had become obvious that we weren't going to go back on the road anytime soon. Plus we are totally comfortable here. The cabin is a little quirky, but then so are we! lol More importantly it's located in a quiet area with access to a nice walk, just a short drive from the nearby town so we can check our emails every few days, the landlords are really sweet and rent is reasonable. What more could one want! 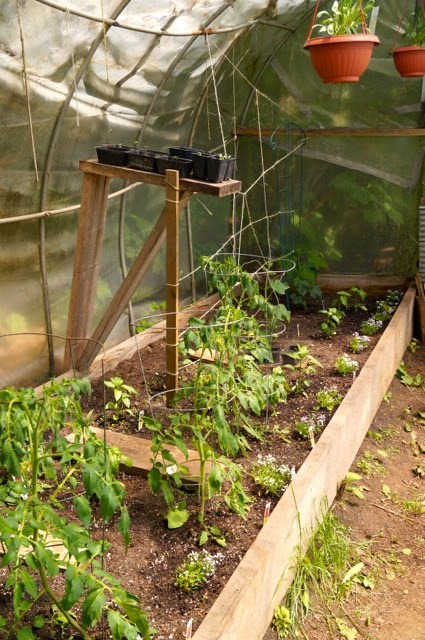 One of the major perks of this place is that previous renters had set up several beds as well as a green house. 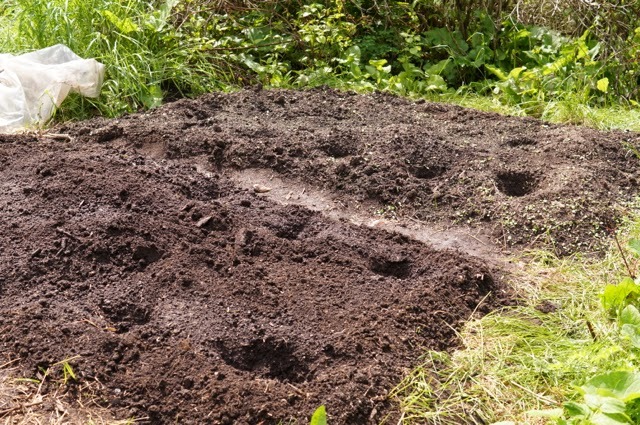 They obviously really knew what they were doing as the soil looks nice and rich and is filled with earthworms; a sure good sign! 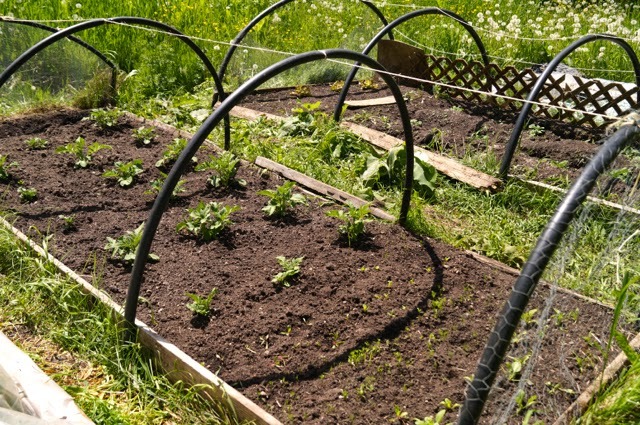 Unfortunately many renters after them weren't into gardening so the beds were all grown over. Preparing them wasn't an easy job but now we're so glad we did! 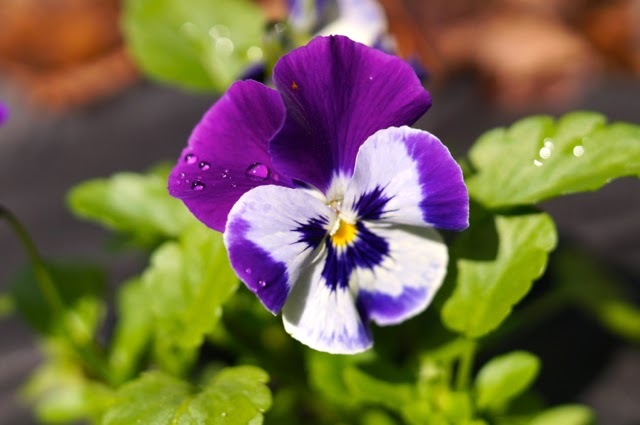 Visiting the garden, tending to the plants and watching them grow have quickly become the highlight of my days! Actually, my little garden routine has become a bit stressful lately since a mature black bear started to make his rounds in our neighborhood about a week ago. He's a bit too brave and even aggressive, so I doubt he'll be around much longer; he'll either get shot or taken away by wilderness services. In the meantime I sing out lout whenever I go to the garden to make sure he knows I'm there. 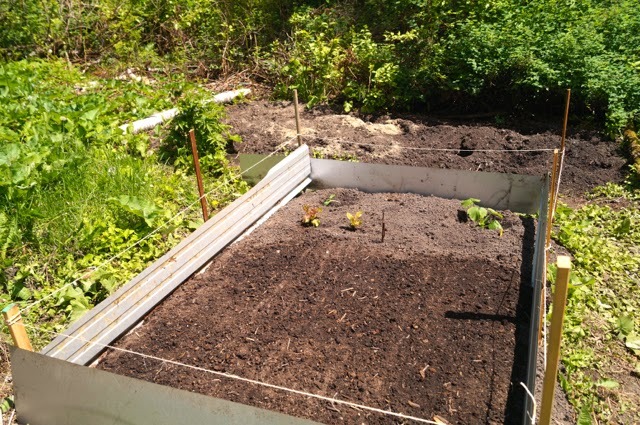 Since I can still only eat very few veggies, I didn't want to go too overboard, planting a bunch of things that I wouldn't be able to enjoy anyways. In the greenhouse we have several tomato plants (I can't do them at the moment but am crossing my fingers that I'll be able to by the end of the summer...), basil, a few bell peppers (which I can have roasted, peeled and de-seeded), and a couple of cucumbers. We've also planted several bunches of Sweet Alyssums in the hope that they will attract bees. Interestingly, we learned that the previous renters had a profitable grow op happening here for a number of years. No wonder they had a green thumb! lol And so we discovered several more beds on the property, hidden under tarps. Woo hoo! Thankfully the going was a lot easier since these had been protected by the plastic. This is me prepping one of the new beds. Notice the slight belly! ;-) I lost several pounds in the aftermath of the colonoscopy in January, but thanks to my diet high in carbs I've put them all back on and then some! I'm now 113 lbs which is the most I've weighed since going raw back in 2001. We've got carrots, beets, green onions and zucchinis in the front bed and, you'll have guessed it, more taties in the one at the back. All together we've planted over a hundred potato plants! 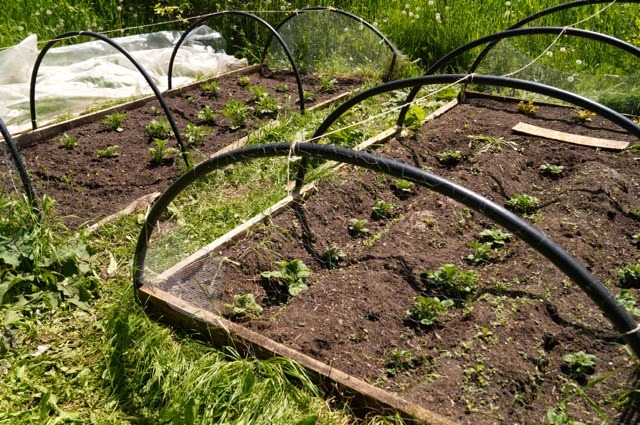 There were already a couple of circular beds right by the cabin which I have used for herbs and flowers. 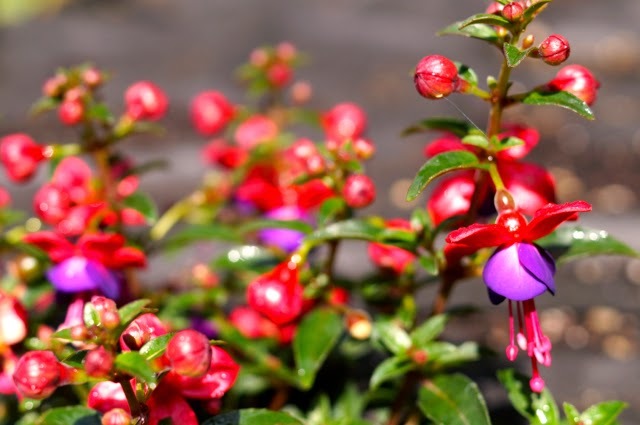 Fuschias... apparently a favorite of hummingbirds, which we soooo love! 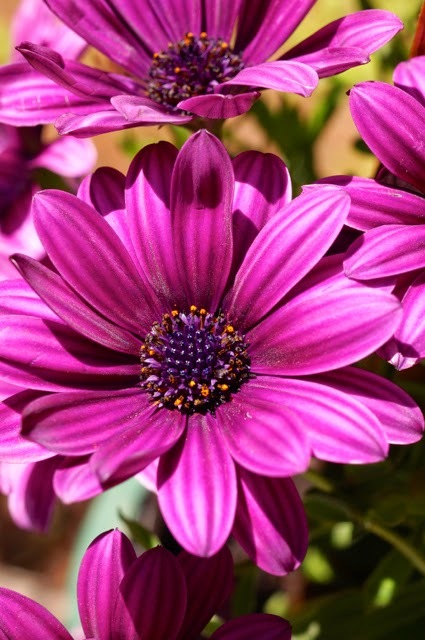 Osteospermum; hum, how can such a pretty plant have such a weird name!?! Yours truly posing with our flower basket. Miss Puss absolutely loves it here! 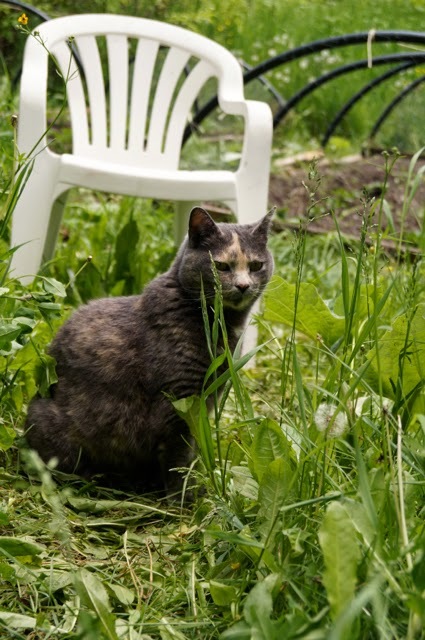 She strolls around all over the place, from the cabin all the way to the other end of the property where the garden is located. 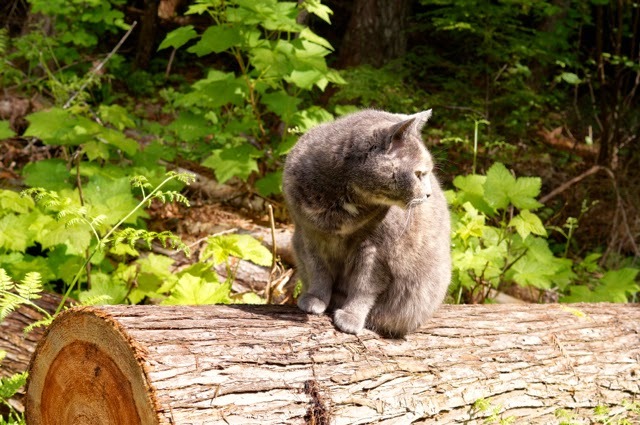 Although these days she, too, has to stay on high alert because of the visiting black bear. 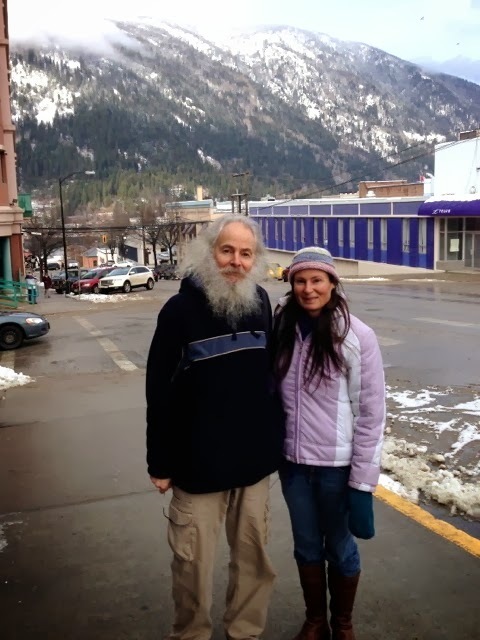 In March I was reintroduced to kundalini yoga. I practiced it briefly when I first went raw but then let it drop in favor of the Rites. 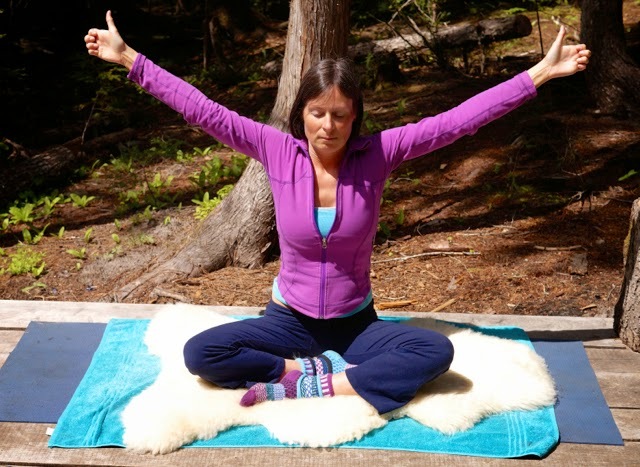 I found myself deeply resonating with its combination of physical poses, breathing techniques, meditations and the use of mantras. It's caused me to experience such a dramatic raise in my energy levels that within just a few weeks I felt like a different person! 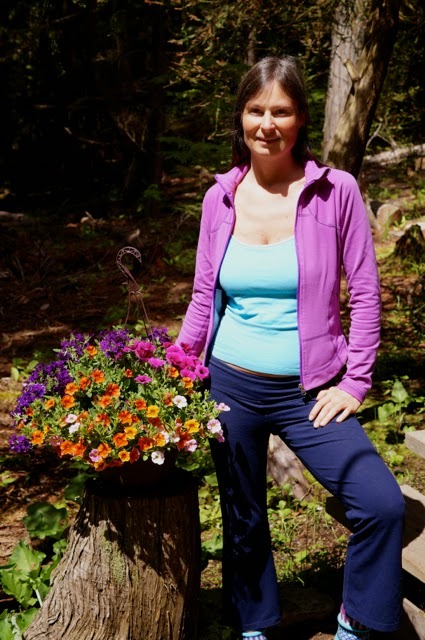 At last I was no longer in survival mode and my life didn't only revolve around my gut issues. Yippee! On average, I've been doing 1 1/2 hours of kundalini yoga when I get up for the last 3 months. 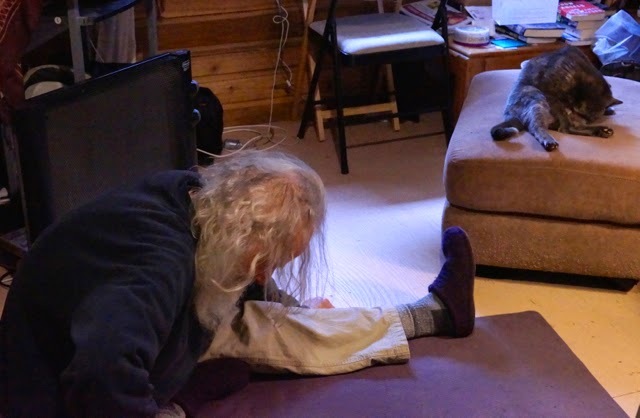 Don has even incorporated a few exercises into his own morning routine. hehe He says about the Tibetan Rites that you must work for them for a few minutes and they work for you for the rest of the day. I find that this is also true of yoga; a very wise investment of my time indeed! I probably wouldn't have been able to do all of the work involved in preparing the garden beds if it hadn't been for it! But mostly my diet revolves around the few things I can eat... Eggs, (very occasionally) chicken (not much lately), lactose-free cheese, white rice, rice pasta, potatoes, carrots, roasted bell peppers, and my gluten free baked goodies (breads, cookies and all sorts of yummy low-sugar desserts). I can also have cashews, macadamia nuts and almonds so lately I've been making cultured nut cheezes and raw sauces that I can enjoy on grains or bread. Woo hoo! Unfortunately I'm no longer able to enjoy a lot of things that I could prior to the scope exams, such as quinoa (boo hoo!!! ), oats, young coconut, celery, mushrooms, broccoli or cauliflower (these cause pain so I eat them only once in a while and in moderation), sweet potato and squash. As for supplements, I have continued to take digestive enzymes, betaine HCL (when I have chicken), probiotics and a combination of slippery elm, marshmallow root powder, licorice root powder and NAG (N-Acetyl Glucosamine) based on Jini Patel Thompson's "Mucosa-Heal" formula which is said to help heal the gut's mucosal lining. Oh, and l-glutamine for the same reason. The one thing that is relatively new is my being able to take a multivitamin powder. I use this one from Youngivity as well as their Liquid Beyond Osteo FX (for minerals) and EFA Plus for essential fatty acids. Hope you guys have a wonderful Spring and Summer! It must be getting close to a year since I've written a 'proper' blog post, journaling recent events and happenings in my life. Dis-ease can do that; knock inspiration right out of ya. I was still hesitating a little about doing this post. For one thing, I can't say that I'm really feeling moved to writing again, at least not just yet. But more importantly, because of my compromised gut all of my action in the kitchen for the last several months has been of the cooked variety. On the other hand, I finally have some 'blogging material' to share with you guys. So raw blog or nay, in spite of my reservations here I am typing away on my laptop (offline as we no longer have internet at home.) I figured that something other than the usual 'health updates' would be a nice change and a good way to start off the new year. I sincerely hope that the strict raw lifestylers among you won't be offended by the cooked content of this post. I promise that I don't intend to make this a habit. If I feel the urge to share more of my cooked culinary adventures in the future, I'll do so on a new dedicated blog. OK, so let's get to it, shall we? 1. 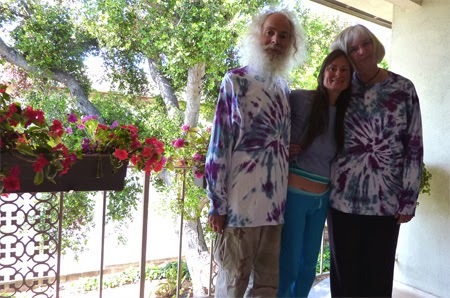 Diane and us share a wonderful, albeit mysterious, deep soul connection. To put it quite simply; we are 'family'. 2. 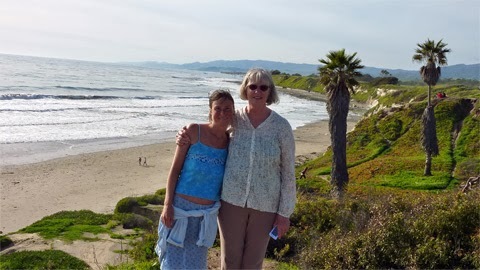 We fell in love with the warm climate and delightful lushness of Santa Barbara. 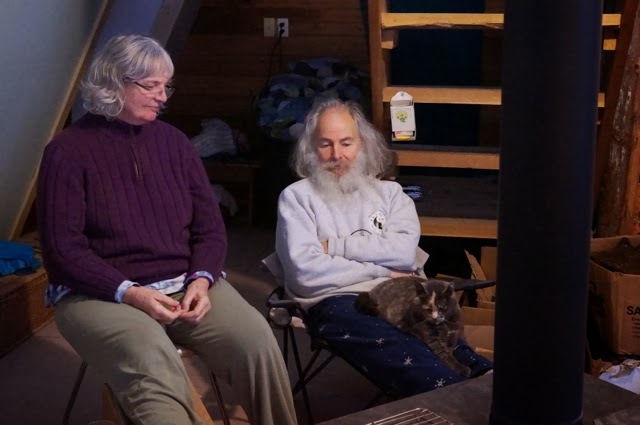 And so we visited Diane again the following year, and I even flew over one winter to spend most of the cold months with her while Don held the fort back in Canada with the furries. 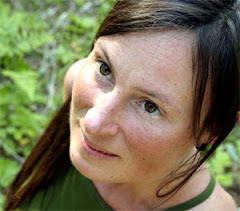 This turned out to be one of the most wonderful winters of my life; waking up nearly every day to gorgeous blue skies and sunshine, surrounded by palm trees, roses and hummingbirds, and bathed in the sweet aroma of jasmine in the evening. *sigh* And of course the companionable presence of Diane with whom I spent copious amount of time playing in the kitchen and quietly crafting. 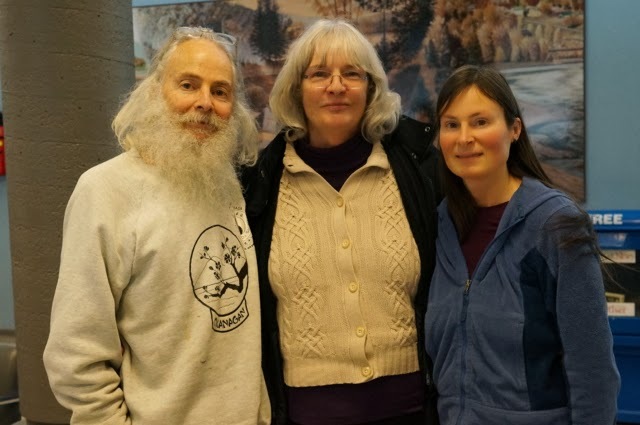 We hadn't seen her in almost 2 years (well, 3 for Don) so we were thrilled to learn of Diane's plans to come visit us in southern British Columbia over the recent Holidays. As it is with true friends, it felt like we picked up right where we'd left off, as though not a single day had passed since we were last in each other's company. 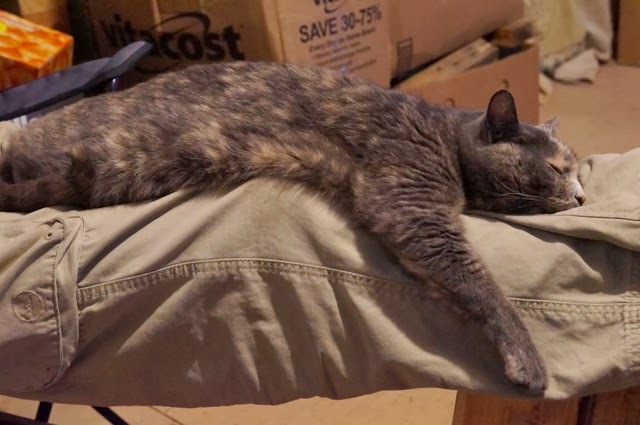 Of course, Miss Puss still lives up to her nickname of 'Heat Seeking Missile'; every now and then hopping from one lap to the other, melting in the luxurious warmth. Don and I don't usually celebrate Christmas per se, other than to welcome the opportunity to cook up something special. Still, I couldn't resist knitting Diane a little token of my appreciation for having her in my life. 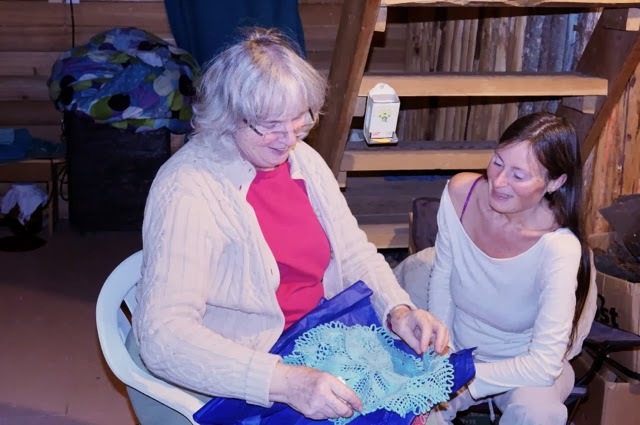 Admiring the doily that I made for her. Perhaps not quite the purpose that I had in mind for it, but doesn't she look ravishing? It's always a bit 'iffy' when it comes to landing at the nearest airport in Castlegar. Due to its location between mountains and next to the Columbia river, low visibility is unfortunately a common occurrence, especially in the wintertime. After monitoring the weather forecast for weeks, we woke up to a beautiful (and totally unexpected!) sunny morning on the day that Diane was due to fly in. The Mystery definitely gave us a hand here as it turned out to be the only clear day in nearly two weeks! It remained cloudy for most of Diane's stay but the sun did peek out on a couple of occasions. 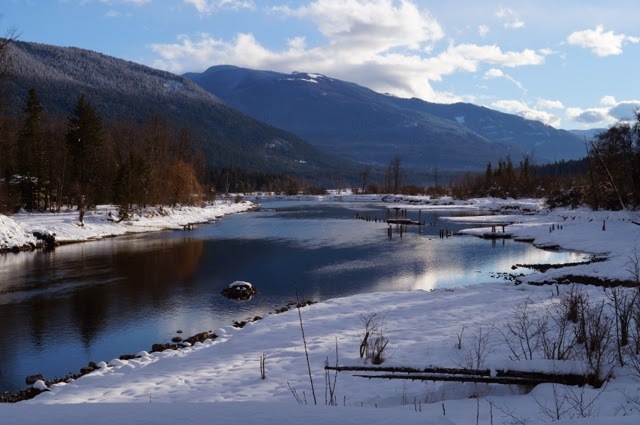 We took advantage of the weather to show Diane around a little and drive along our beautiful Slocan River. 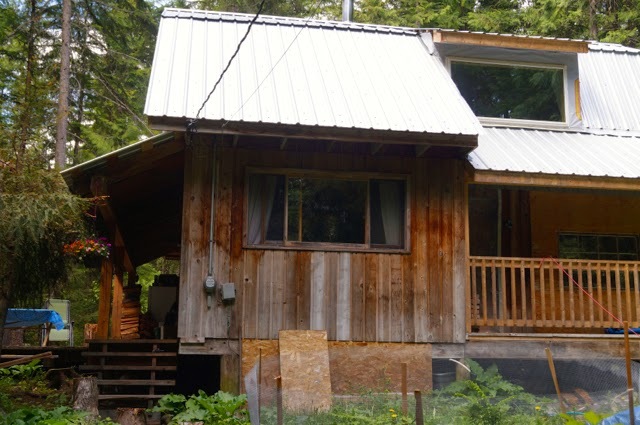 We're so cozy, tucked away in our little cabin in the woods, that we try to keep our trips to the nearby town of Nelson to a minimum. We did go once with Diane to do our bi-monthly shopping and give her a little tour of the place. As the list of ingredients my gut can tolerate has ever so slowly expanded over the months, I have been able to enjoy gradually more elaborate dishes. In the necessary shift from being almost solely focused on taste to giving my body what it needs, my enthusiasm for cooking has suffered a great deal. In any case, I certainly don't have a lot of extra energy to spare for being creative in the kitchen. For the most part, I am quite content to follow other people's culinary guidelines. From my raw days I've learned that it can be a rare occurrence indeed to find a recipe creator with whom I have what I call 'taste bud alignment'. At the very least, everyone is so unique that it's almost to be expected that some slight adjustments will need to be made to bring a recipe to your liking, such as for salt, sweetener and spices. It can take a while to get to know a particular chef's proclivities in those regards, therefore coming to trust someone's recipes can be a slow process fraught with lots of trials and errors. 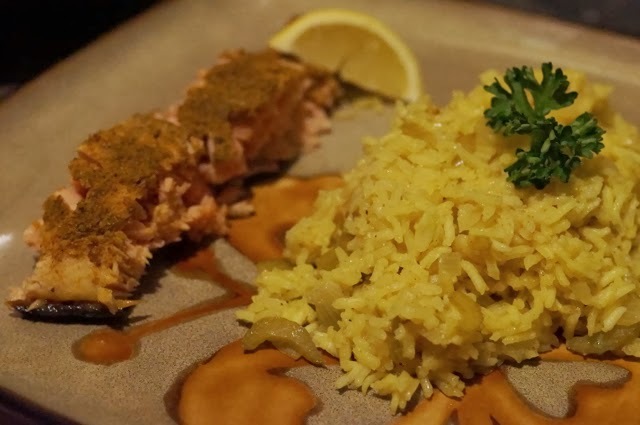 I was blessed to stumble upon two gluten-free chefs very early on this forced cooked phase that are not only very talented but that I quickly discovered I could trust for consistent yummy results: Bette Hagman, a lady who has been cooking gluten free for more than 40 years, and Carol Fenster. I'll be pointing to the relevant books from which some of their wonderful creations have been taken. ... and Butternut Squash Soup. 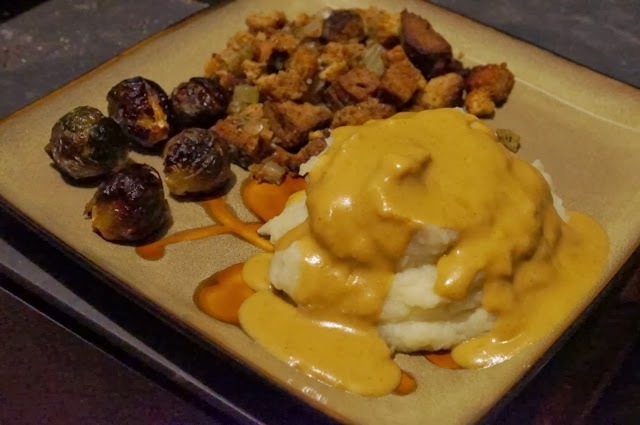 Our Christmas feast: Carol's Creamy Mashed Potatoes, Vegan Gravy, roasted Brussels sprouts and Herb Bread Stuffing from Annalise G. Roberts Gluten-Free Baking Classics. Yummo! We enjoyed the left-overs a couple of days later with the addition of Quinoa Burgers and sweet potatoes (which we actually forgot to serve at Xmas! lol) Oh, and we drenched the whole thing in a delicious Mushroom Gravy. Since I no longer feel like spending a lot of time in the kitchen, I have been building a repertoire of simple entree staples that I can count on, many of which we shared with Diane. 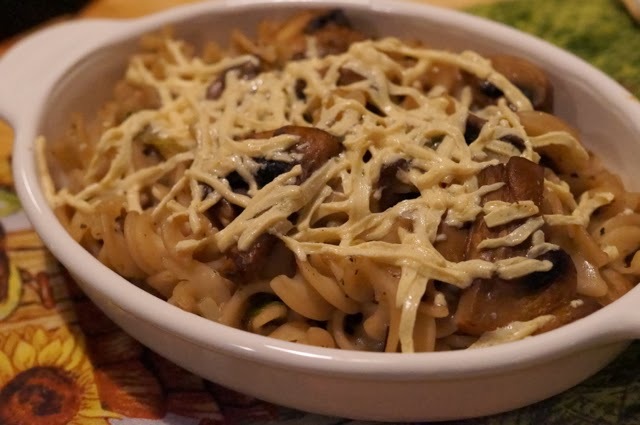 Our go-to recipe when we're in a pinch: Rice Pasta with Sauteed Mushrooms and Green Onions in a Cream of Mushroom Sauce. 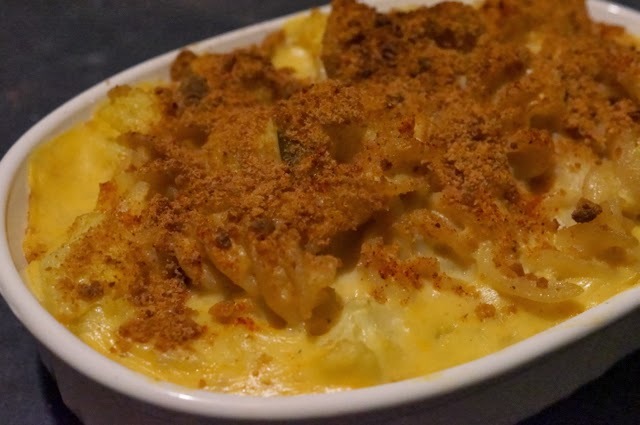 I usually top it with vegan cheese shreds (made from tapioca) and pop it in the oven for a few minutes for the cheese to melt. 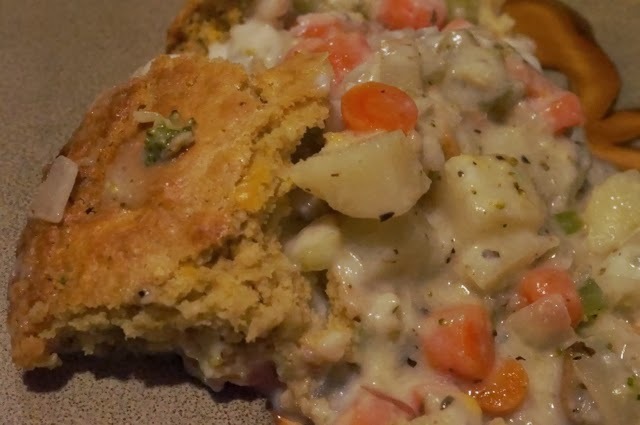 Comfort food at its best: Bette's Vegetable Potpie topped with Buttermilk Biscuits from The Gluten Free-Gourmet Cooks Fast And Healthy. I do occasionally come up with my own concoctions. 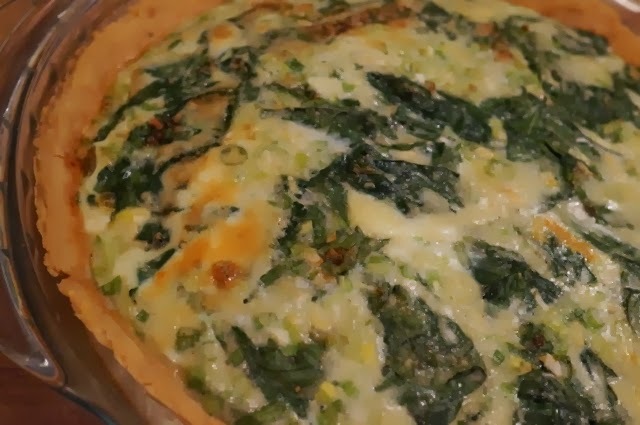 Here's a Spinach Quiche made with Bette Hagman's Featherlight Vinegar Pie Crust. I can't have anything hot or spicy so I've been mostly using dried herbs to highlight savory dishes. However I recently discovered that I'm actually fine with Indian spices, as long as I stay away from chili powder and any kind of pepper. Hurrah! 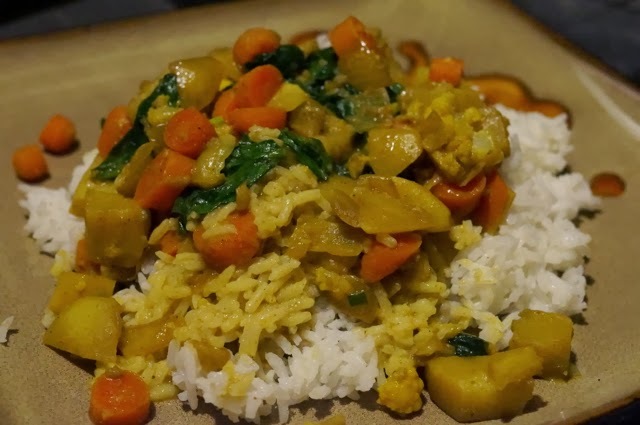 This Vegetable Tikka Masala from Carol Fenster's 125 Gluten-Free Vegetarian Recipes tasted like heaven to me after all these months of blandness! Since giving the Specific Carbohydrate Diet a try last summer, I haven't been really drawn to eating meat. I did the latter out of necessity at the time and, quite frankly, I don't enjoy consuming animal flesh very much. I still have some wild BC salmon and locally raised organic chickens in our freezer, so I thought Diane's visit would be the perfect opportunity to make a dent in those supplies. I used locally raised organic chicken mainly for making stocks and broths which are considered to have very healing and soothing properties, especially for the gut. As a result the chicken meat I was left with was both tasteless and rubbery. 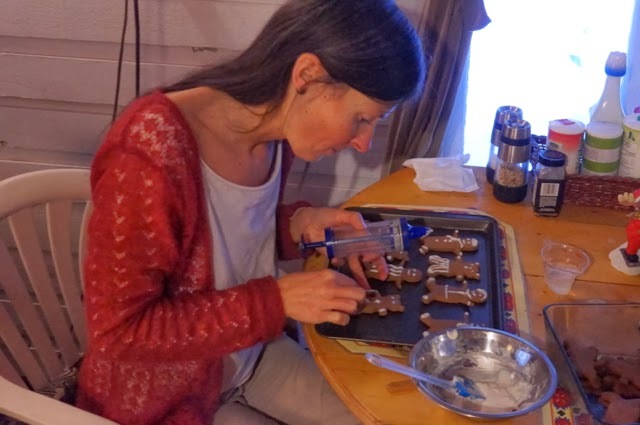 With Diane here I made my very first roasted chicken which I opted to do in the slow cooker. If you are going to cook chicken what a fabulous way to do it! 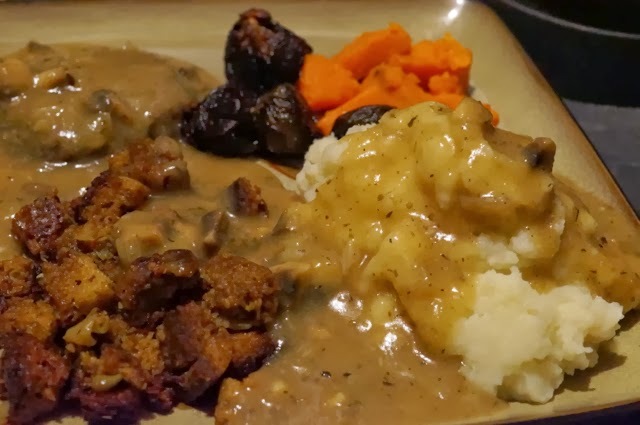 It's energy efficient, mess-free and the resulting meat is very moist and tender. 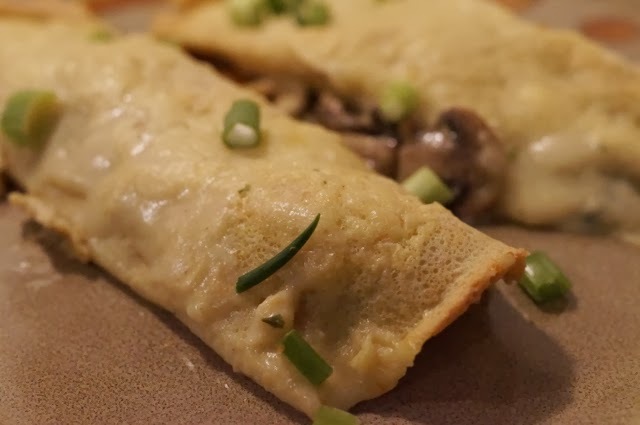 We served some of it in the following Bean Flour Crepes, stuffed with mushrooms, green onions and spinach, and baked in a white sauce. Another excellent recipe from Bette Hagman featured in The Gluten Free-Gourmet Cooks Fast And Healthy. Since I must carefully monitor the sugar/fructose I eat in one sitting it has turned dessert making into a bit of a challenge. Thank goodness for stevia is all I can say! I try to limit the amount of sweetener I use (mostly coconut sugar, honey or molasses), to about 1 tbs per serving and make up the balance with stevia in powder or liquid form. I used to absolute hate the stuff until my friend Matthew introduced me to KAL's products which don't have any aftertaste at all. One thing I remember from the Holidays of my childhood is my mom always having a platter of cookies lying about. 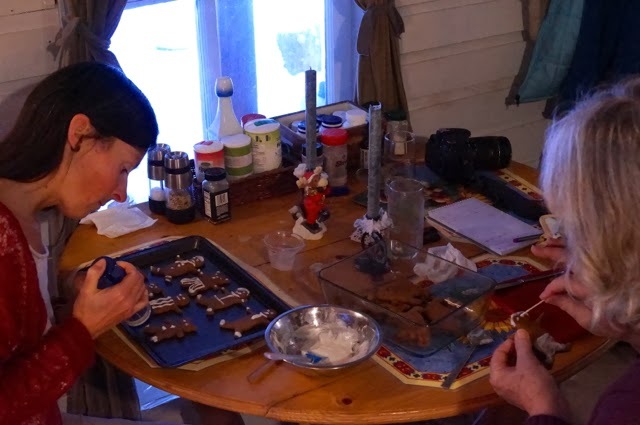 I somehow managed to whip up 5 different kinds with Diane's precious help, but boy, was it ever a lot of work! 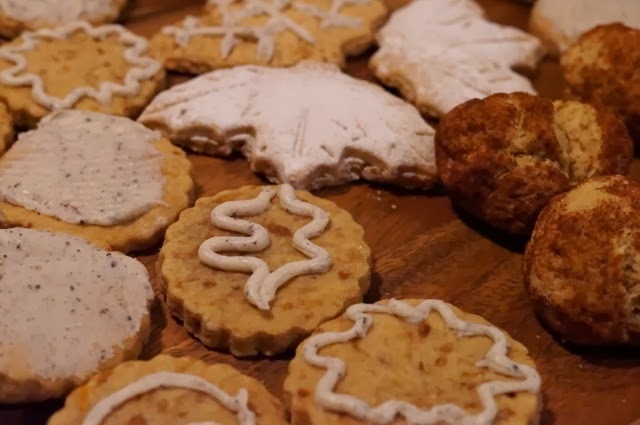 Below you can see Orange Spritz Cookies from Cybele Pascal's The Allergen-Free Baker's Handbook on the left/bottom (very, very yummy! Almost like shortbread...), Roll Out Cookies from Beth Hillson's Gluten-Free Makeovers at the top (nothing special) and Snickerdoodles also from Cybele Pascal on the right (OK but a little dry). 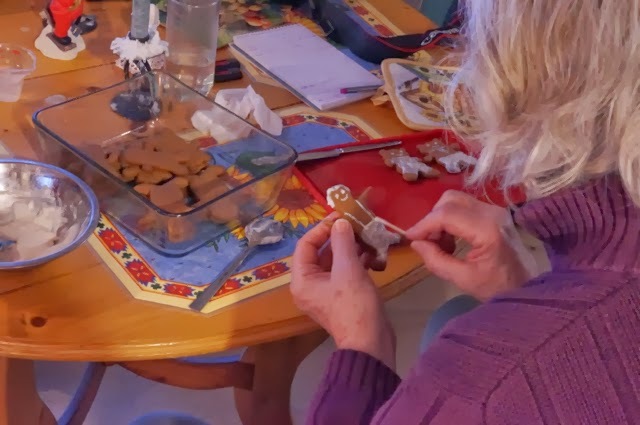 The most fun part was of course decorating Cybele's little Gingerbread people with Diane. We had a total blast! 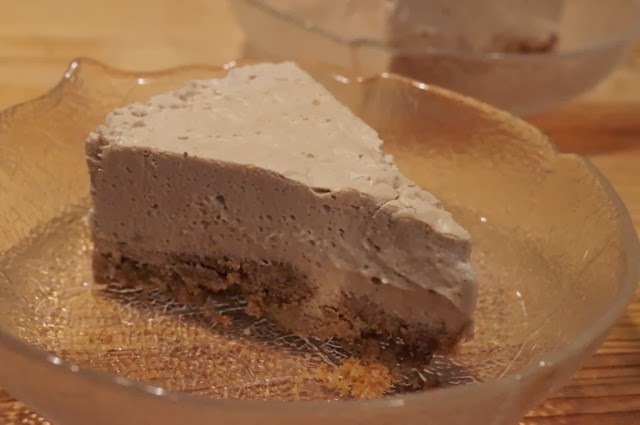 Bette has a low sugar version of Confectioner's Sugar made with milk powder substitute and tapioca starch which turned out to be a life saver for making icing. 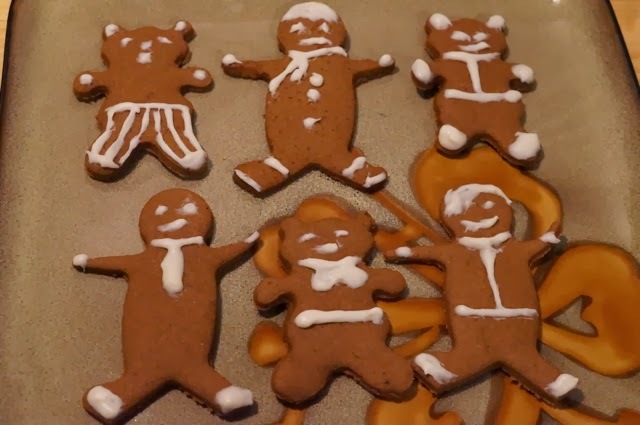 Also, my Devilish Gingerbread Bear at the top and my Pirate at the bottom. 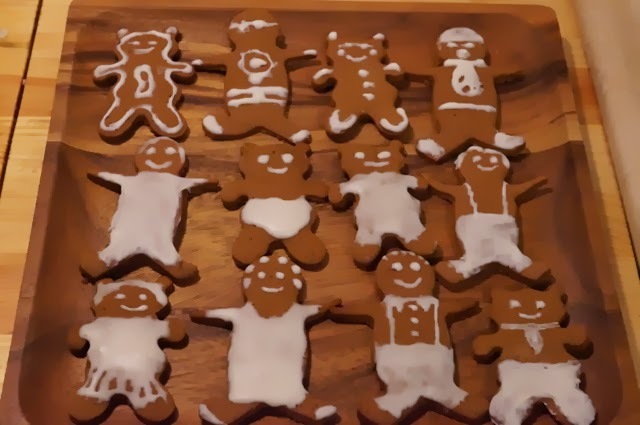 The only problem with making Gingerbread People is that they're so cute you don't want to eat them afterwards. But eat them we did and they were super delish: spicy and moist. 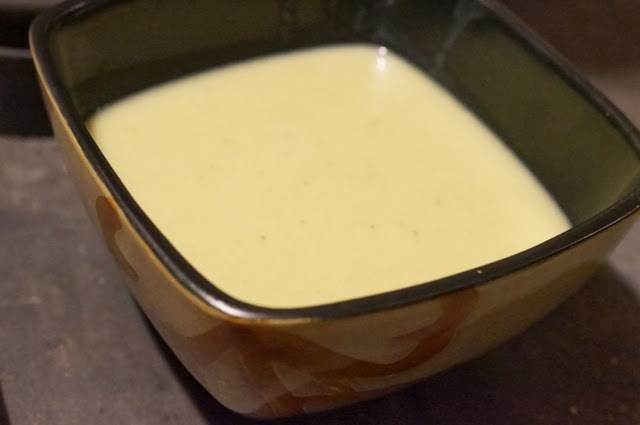 Since I often end up with extra egg yolks from Bette's breads, one of my fave ways to use them is to make a simple Vanilla Custard on the stove. 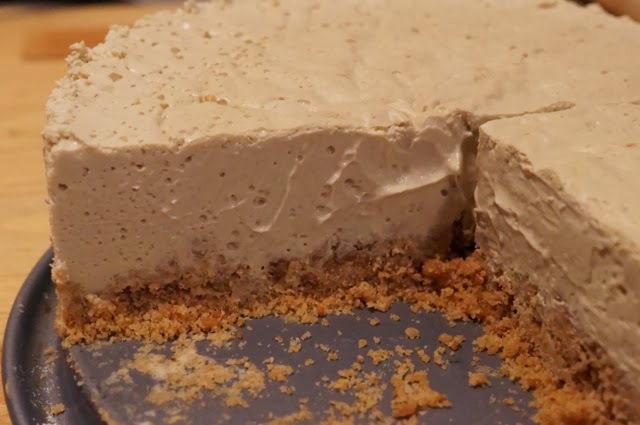 I've come up with a slightly more elegant rendition in which I add melted coconut oil and lecithin to the custard and serve it on a gluten-free Graham Cracker Crust. Need I say more? I was all excited to find a silicon tube pan on sale just before Christmas and could hardly wait to use it. 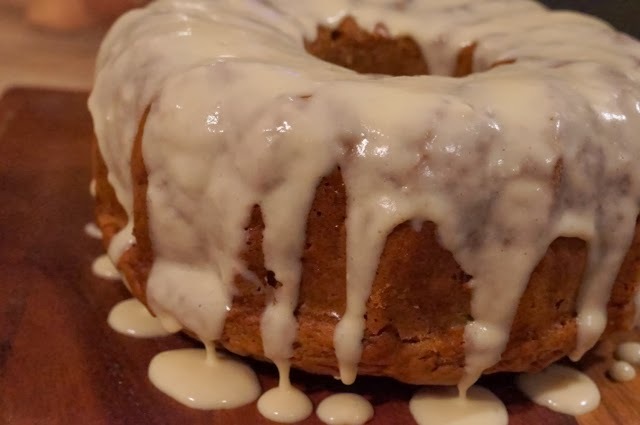 Unfortunately I've had a few duds in my gluten-free cake experiments, but I was rewarded with this Zucchini Bundt Cake from Bette's More From The Gluten-Free Gourmet. It rose really well and was very moist. The only booboo I made was to forget to add stevia to the batter (ooops!) so it was seriously short on the sweet side. This was easily remedied, though, with a couple of shakes of stevia powder for me and a drizzle of extra maple syrup for Don and Diane. I must stay away from flax or any other type of seeds, therefore I can't eat any type of raw crackers. And so I've been experimenting with gluten-free breads. It's been a rather long and bumpy road as baking without gluten is definitely an art that I have yet to master. 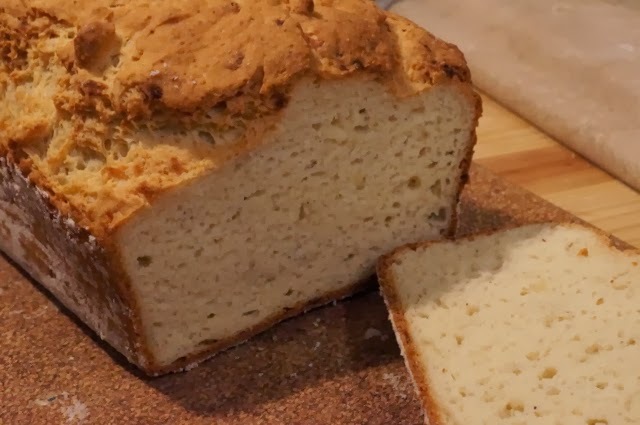 Thankfully, Bette Hagman has once again come to the rescue with her The Gluten-Free Gourmet Bakes Bread - a must have for anyone interested in the subject. 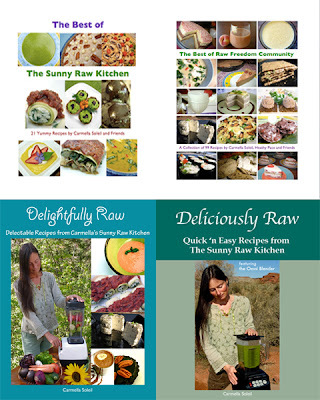 She shares dozens and dozens of bread recipes, using a variety of home made gluten-free flour blends. Every single breads I've made from her book has turned out fabulously well (except for the odd mistake on my part due to the oven being too hot or taking the bread out before it's ready.) In fact, after picking this book up at my local library I was so impressed with Bette's recipes that I proceeded to order all of her other books (you can buy them used on Amazon for super cheap!) Two of my favorite breads actually come from Bette's earlier works. 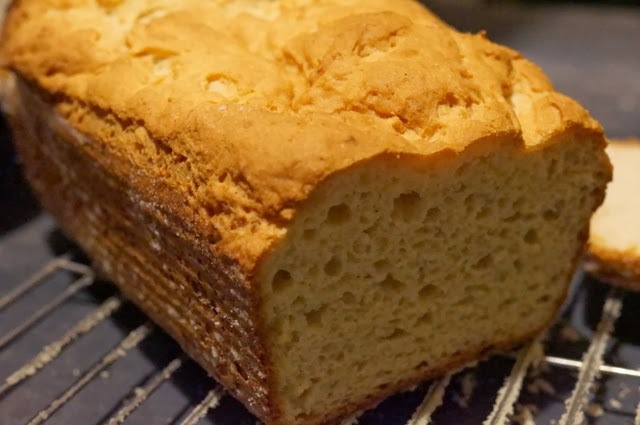 This turned out to be the lightest and closest in both texture and flavor to regular wheat bread of all the gluten-free recipes I've tried so far! 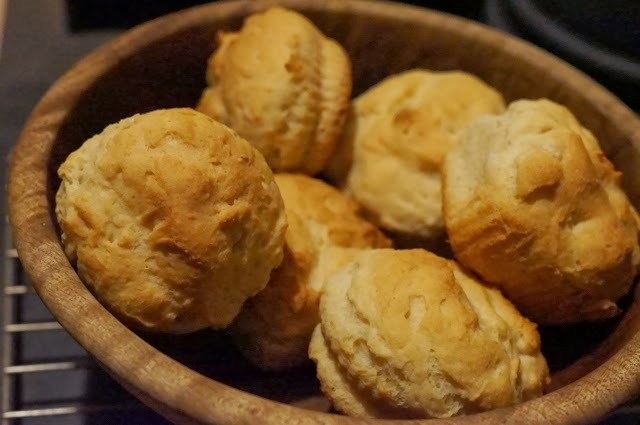 I made some of the dough into dinner rolls. 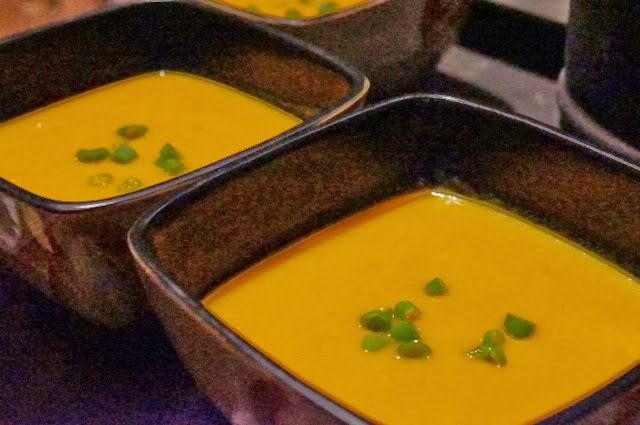 Simply sublime served warm with a dollop of homemade Coconut Vegan Butter. 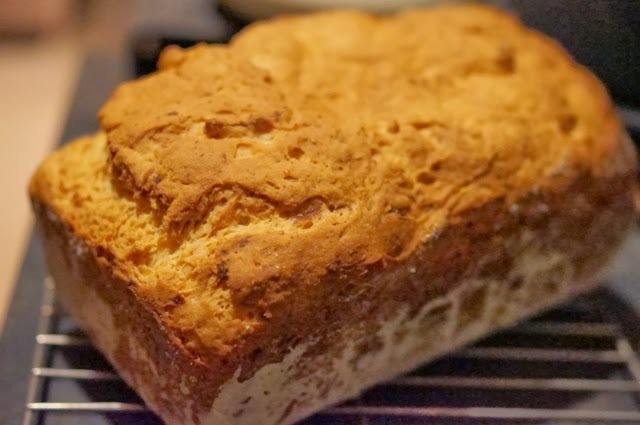 Old Fashioned Potato Bread from The Gluten-Free Gourmet Cooks Fast And Healthy. I hope that you too had a fabulous Holiday Season and that the New Year has begun on a positive note for you all! Will you hold me in your prayers and hearts so that it all goes smoothly?